Fight! Fight! Well, that one was much more fun than the first leaders’ debate. Aggro, thrusts, parries, palpable hits and one or two moments of high comedy. Gordon Brown, his fringe stiff with hairspray, kept smiling like Jeff Tracey from Thunderbirds. Nick Clegg developed a case of the sweaty Bettys. Mop wallah! Quick! Swab down that man. David Cameron again frowned rather a lot, though he did remember to point his poached-egg eyes directly at the camera lens. I can’t really say that I thought Messrs Brown and Cameron did much better this time because I thought they did pretty well last week. Shows how much I know. But the energy level was higher last night. Mr Cameron did less of the calm statesman act and tore into his opponents. Attaboy. There was more butting in - Mr Clegg’s voice repeatedly barging Broon out of the way. Poor Gordon. He was too polite. Most unlike him! There was a goodish bust-up about some Labour leaflets which allege that the Tories would get rid of fuel allowances and free telly licences for the elderly. 'Pure and simple lies,' growled Mr Cameron. He told Mr Brown he 'should be ashamed'. Mr Brown laughed. This time Mr Clegg was the glistening piggy in the middle. 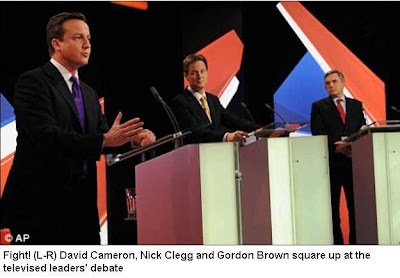 Mr Brown, owing to his squiffy eye, was again allowed to stand stage left. The trouble with the middle position is that, like a tennis spectator, you have to look from side to side to watch your neighbours. This can lend the person a shifty aspect. Mr Clegg solved this problem by scribbling notes at his lectern. Security was much heavier than last week. Bristolians thronged around the docks and police were out in force. A good night for the burglars of south Gloucestershire. Fathers For Justice graced us with their presence and an anti-war group yelled abuse when Mr Brown arrived. On arrival, we were greeted By a recording of jungle drums. You could almost sense Red Indians on the brow of the distant Cotswolds. Two wags. Sarah Brown was doing her Nurse Ratchet routine - is that a syringe of sedative in her handbag? - and Mrs Cameron did the willowy fashion babe turn. In the absence of Mrs Clegg we had to make do with Paddy Ashdown, squinting like a chap with constipation. 'I’m yer man,' said Mr Brown at the start. Wasn’t there a Leonard Cohen song called that? At times the whole thing felt less like an exercise in democratic accountability than an advert for Sky News. Branding everywhere. Our compere for the evening, Adam Boulton, sat at a table and held a Sky News cue card like Cilla Black on 'Blind Date'. Peter Mandelson was nowhere to be seen. Peter! I missed your sensitive steers. In his place we had a Labour spin operation led by boy scout David Miliband. That sensitive flower Charlie Whelan, the trade unions’ hit man, was also on the premises, chewing wasps. The questions were more interesting. Some man asked about the Pope’s forthcoming visit. Mr Clegg piously told us that he was 'not a man of faith' and then told Catholics they should show 'greater repentance' about the child abuse scandals. This was the one moment in the evening when I nearly threw something at the screen. Ruddy man. If you’re godless, Cleggy, spare us the pulpit talk. An old dear called Grace asked about pensions. 'Women, and you are one of them,' said Mr Brown in his answer. Hoots of delight in the press room. We also all enjoyed the moment he compared the arguing Cameron and Clegg to his two wee boys at bathtime. Mr Clegg cited President Obama at one point. I wonder if Mr Obama knows that he, Barack, is the Nick Clegg of American politics. Mr Clegg, keen to show himself a tough little nipper, addressed the other two as 'Gordon Brown' and 'David Cameron' rather than simply settling for Christian names. This started to sound forced. Cleggy also kept using his hands again. When he said the word 'big' he waved his hands in the air and bulged his eyes. Very Jackanory. Two down. One to go. Next week, grapple fans, we go to the Midlands. Until then, thank you for watching. And now a message from our sponsors. Didn't watch the debate but " Brown kept smiling like Jeff Tracey from Thunderbirds", is the best line so far. And the public buy that politics UK is only about Slippery Nick, Call Me Dave and Bovine Broon? There's no concept of any other parties or interested people in the political sphere? Please forgive me for my ignorance about your elections. The only thing I know for sure is that Gordon Brown is not your favorite (and that's putting it mildly, ha, ha). It seems from reading the debate reviews, none of these guys are favorable. Please make me a little smart and tell me who you think is worthy to take the helm, or is there anyone? I take it you're not 100% happy with David Cameron. But Spidey, you have to give him 100% of your help. If Brown gets in there again, you'll lose your country forever. Brown is on a Britain distruction path that has never had greater parallels in your history. I couple of bits from Sky News and was hoping to see a real debate like you brits have with PM Questions. But alas, these like ours in the U.S. prove to be less a debate and more an advertisment. One observation about Brown besides his obvious hairdo fix; Does this man always have marbles in his mouth? Honestly, after every word it seems he was fighting to keep marbles contained in his mouth,almost fighting to do so. By the by, my apologies in my lack of decorum and grammar in not capitalizing my abbrieviation Brits. I did not intend any offense. My area has a massive Tory majority, so overturning it is highly unlikely. I'll be voting UKIP to make a dent in that majority! I don't want the MP becoming complacent - I want him to know that he'll have to fight for his constituents to retain his seat. Great recap of the event, Spidey. It was fun, I'm glad Sky had put it live, so I could watch.